A superhero is described, a man called Major Victory, who fights for country and the common man. He has super strength, he can fly, and he's an attractive white male. Now, however, he is curled up on his bed as outside, the threat of the Hollow Men looms. In Texas, a man is being strapped into a lethal injection table, only to be saved at the last minute by a red, blue and yellow figure with the governor and the real murderer. The Governor pardons the man the next day. Clark Kent goes to see Ben Conrad give a speech on the mid-nation farm man and his influence on the writing life he's lead. Later, over dinner, they discuss how Ben helped Clark become a reporter, and they discuss his new fiction book, Champion of the Oppressed. A riot breaks out at the Deltimar Diamond Refinery, and when the police come to beat the workers, Champion of the Oppressed steps in and saves them from the police. On the news, Champion is described as a Circus Strongman, fighting "social aggression." Ben Conrad, watching this, is interrupted by Clark knocking on the door, asking if they need to talk. Conrad tells him about Champion, and starts to defend his actions. In the desert, a crew of officers beats an illegal immigrant, telling him that he will receive worse when he meets INS. Champion moves in and starts beating the cops senseless. Clark sees the reports of the attack and talks with Ben, trying to reason with him, telling him to delete Champion. The police are defeated, and the army moves in to take Champion out. Battle commences. Clark tells Ben to do the right thing, then leaves to "check the meter", really going to the scene. Conrad dwells over his computer and finally deletes Champion. Superman speaks with Champion as he fades, telling him that though his methods were not on the right track, he would carry on his dream to fight for truth, justice, and the American way. Later, Clark apologizes to Ben that things had to end in such a way. Conrad reassures him, but as Clark is leaving, we are shown a work of fiction on the floor describing The Hollow Men, a work of fiction by Benjamin Conrad. First, Major Victory has almost nothing to do with this issue, nor do the hollow men. I see several reasons I believe this. Either, A) I'm missing some huge connection with the Hollow Men and Major Victory in past continuity obscurity, B) They are new characters with sub-plots beginning here, or C) They were just meant as a dispensable side product of the imagination of the author, which isn't very clear. Either way, I tried to find the deeper meaning, I tried to look into the simple, and I just came up confused for A, B, and C on all fronts. It's nice to see an homage to other famous moments in Superman history, what with the wife-beater (a nice reinterpretation, but still), the execution (wow, change an electric chair to a lethal injection table. BRILLIANCE! ), and the riot. But it's been done to death (Dominus, Bog in Man of Steel a while back, specials, Elseworlds, etc), and there are many things in continuity that have been dragging on for too long and need to be resolved. Why are we tormented with these one-issue stand alone stories that do nothing but characterize Superman? I mean, JEEEEEEEZE. He's a principled idealist who fights crime with superpowers. He has a second life, as Clark Kent, which isn't easy to maintain. He fights to protect his secret identity. He's a writer, a husband, and the most powerful man on Earth. WE DON'T NEED TO BE REMINDED OF THIS FOR THIRTY OUT OF FIFTY-TWO (whups, did I say fifty-two? I meant 39�.now, thanks to issues like this.) ISSUES A YEAR! EXCLAMATION, EXCLAMATION, EXCLAMATION, AND BE GLAD ALL EXPLETIVES ARE DELETED! That said, we have the fact that Superman's character is being shown in this issue, but WAIT! Look here! We have misguided characterization. His own evil doppelganger alter ego, Champion of the Opressed, is out wiping tanks across the world and taking on the army, and what does Superman, defender of the innocent, ma, apple pie, the American Way and Wheaties do? He sits back and tries to simply TALK Mr. Conrad into deleting his book. Never mind that there's no inkling at all as to how he can suddenly write things into being, nor why he isn't BROUGHT TO JUSTICE for PERPETRATING PROPERTY DAMAGE AND INJURING BRAVE MEMBERS OF THE ARMED FORCES, but that's just tertiary at this point. The officers deserved to be brought to Champion's brand of "justice", but the army did not. It's one thing to have an homage to the older Superman. I understand and respect that, to a degree, but it at least has to be COHERENT and ON in terms of characterization and reasoning. Look. Here's what Superman would do. A: Walk over to the computer, pull up the file, delete it. Talk with Conrad, reassure him, whatever, just stop the danger to innocents. That's what Superman does. Or B: Barring the fact that he could just hit delete, say he felt it amoral or something, he would immediately take off to stop Champion himself. That's what Superman does. He doesn't talk people down. That's what Maggie Sawyer, Lois Lane, Jimmy Olsen, or even Batman does. Because they are human. Superman has power beyond mortal man, and though he has brains, the brawn is mainly what he fights evil with. I feel like a fool, because I just supported the work of Casey of late in my article for the Big Blue Report. Now I seem like an idiot. Great. I'd love to know what the cryptic Hollow Men book on the floor means, and what it does to connect with the random and worthless opening to the book. I say random, because it is, and worthless, because as a piece of story it means less than nothing to me right now. Some cat named Major Victory is afraid of The Hollow Men, goons in hats who look like a cross between Lurch, Solomon Grundy, and the Gorillaz. Oooh. I'm scared. Add in a reference to TS Eliot, and what do you have? Worthless. A trick of the writing trade I'd be embarrassed to have tried myself. Throw in an allusion, a cryptic reference to the future, and what looks like a villain. I mean, I'm all about allusion, but make it cool, not that done to death piece of quote. Not with a 5 but a 1. Art - 1: The splashes on five and seven are completely unnecessary, and filler. First, the dramatic entrance of the pseudo Superman has no detail, so the splash loses its drama. One could argue that the shadow adds a bit to the mystery, but we already know at this point that this is not really Superman, and there's no reason to feel we won't know by the end of the issue, which we do. It's not that dramatic, it doesn't need a whole page. Establishing the scene with Clark as well could have been done in significantly more brief fashion. Add in the overly spread page on 3, and I get the impression that a lot of the story was thinned into the art. Maybe I'm wrong, but that's the impression. I've made it clear that I don't like a dark and evil looking world for Superman to dwell in, nor a dark and evil Superman, for that matter. I speak for a lot of fans in this. They write and tell me that this is the case. So when I see it, now, after several years of heading in this direction maybe half the time, I don't have much patience for it anymore. Cover Art - 1: Doesn't happen in the issue? Check. Superman contorted, as if in bowel movement? Close. Note: Month dates are from the issue covers, not the actual date when the comic went on sale. 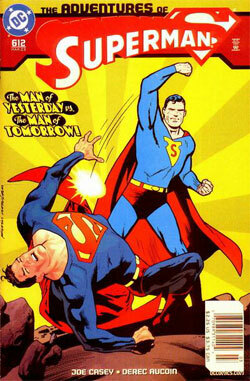 Check out the Comic Index Lists for the complete list of Superman-related comics published in 2003.